Visit the largest alien and ufo news website webelieveinaliens. Miracle of the Gods Reveal Alien Truths? Do you believe in God? Almost 99%of the people reading this text would say “yes” for an answer. Why do you believe in God? Most of the people will now be confused as not many people know why they believe in the spirituality of God. Not many people even have an explanation behind the belief that how God exists. It is not your fault. We have been simply fed an agenda since our childhood which is why we just follow the particular agenda that God exists and he sent Jesus Christ as his son who could do miracles with his gifted power from God. Have you ever thought that this might not be true? If you have not, it’s time for you to open your mind and allow yourself to analyze another agenda. What is the other agenda? 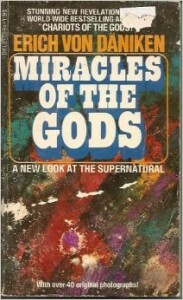 You need to go through Erich von Daniken’s “Miracle of the Gods” in order find out the other agenda. The title of the book and the inner discussion are completely different. The title does not explain the spiritual God. Erich von Daniken has a different belief when it comes to God. In his view, God is not spiritual and he does not exist. According to Daniken, people have mistaken aliens as spiritual Gods. All the religions and cultures depict almost the same kind of miracles and Gods which is why Daniken believes that in the time when there was no awareness and technology the people confused aliens as Gods. Let me ask you a simple question. What would have happened in an ancient civilization if a UFO landed and extraterrestrials came out of the UFO and told you that a flood is going to come? What you would have done was that you must have considered the alien as an angel or God who came from the skies to help the mankind by telling you to run away from flood area. This is how Daniken has proved his point in the book that there was no man named Jesus who could perform miracles. Religions have been spread on our planet due to complete confusion or master planning of the aliens. It would have been extremely easy for the aliens to present themselves as Gods by presenting simple tricks as miracles for those people who did not have any understanding regarding technology and science. Today, every human being knows that we can predict floods and other disaster. The miracles which have been mentioned in The Bible are absolute misunderstanding of the way people have interpreted the events they saw. Daniken also conveys the message that Bible might not be the word of God. Daniken proves his point that New Testament is entirely based on politics rather than the word of spiritual God. The length of this article is not enough to clearly explain the point of view of Daniken. One must become completely unbiased and rational to analyze the other agenda which we have never been exposed to. ← Did Moses Talk to Aliens?